Marlenne Dominguez’s five-and-a-half years as an instructor for the Lawrence Park and Recreation Department’s Unified league came to an end Friday. Dominguez, who was overwhelmed with farewell hugs from many of the children as she got ready to leave for Maryland on Friday, began her career as an instructor in January 1999. She began working with a basketball league that provided an outlet for children with disabilities to play with children who did not have disabilities after being a referee for the district. Dominguez said she had enjoyed working with the Special Populations because of the environment it provided. The league itself has adapted over the years. Many of the children who participate in the league do not have disabilities. Some are siblings or friends, while others participate for the unique opportunity it provides. Nathan Herries attends the games with his disabled brother, Zach. In the winter Nathan plays recreational basketball with “typical kids,” and Zach helps coach. Trina Rausch learned of the league through her work as a speech therapist in Lawrence. 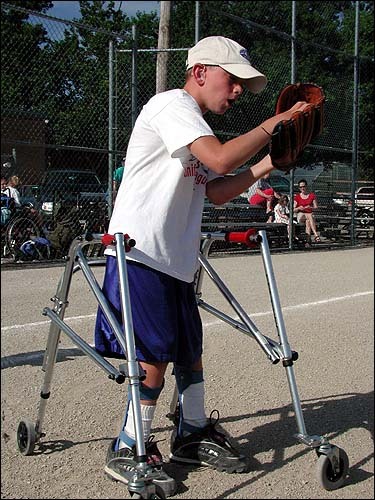 Her son, Liam, does not have a disability but signed up to play in the league because it was a good environment to learn how to play baseball. Zach Herries catches a ball while warming up for a Lawrence Park and Recreation Unified youth softball league. Zach said his favorite part about playing baseball is throwing. “We just wanted something educational and laid back,” she said. Mitzi Robinson’s son, Stephen, is too young to play in the Parks and Recreation’s baseball league, so their options were to play in the Unified league or Blastball. “This is a great way for him to learn how to play baseball outside,” Robinson said. Robinson said that Stephen went to school with students who have disabilities so he was already accustomed to an environment with people who have different challenges. Dominguez says she will miss working in Lawrence, but hopes to eventually continue her work with special populations and incorporate it with working with the Latino community. As for the Unified league, it will continue be a prime example to the youth of Lawrence how sports can connect a community like nothing else can.